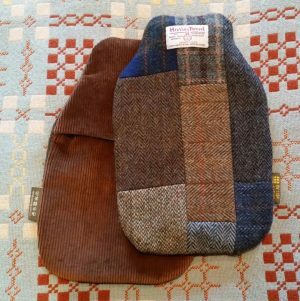 Keep warm and cosy during wintry weather with a one of a kind 100% British made Harris Tweed Patchwork Hot Water Bottle. A request for a Harris Tweed patchwork hot water bottle got me thinking…Now available using my Harris Tweed fabrics for the top with softer British fabrics from my collection on the back, so if you have a preference for colours and fabrics just ask, as I am making these to order. All hot water bottle covers are fully lined, with hidden seams and fit a 2L hot water bottle. The Harris Tweed hot water bottle cover here links to my Gentleman Explorer Quilt, the Shackleton.